Designed for pilots and mountaineers. Easy to transport the Velvia combines the powerful features of a performance-intermediate glider with a low weight. The market is full of "simply designed" mountaineering gliders and we guess some of them are really boring and slow to launch. MAC PARA decided to combine a higher performance wing with light weight materials. 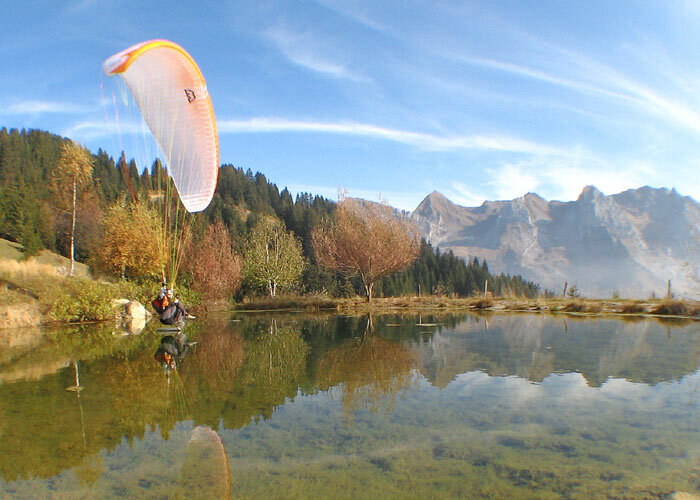 Why to buy two paragliders if one can be enough? Those pilots looking for the lightest performance intermediate can save a lot of money this way. Thanks to the excellent reports from Eden 3 pilots MAC PARA decided to use the same canopy design and a similar line construction to the Eden 3. The Velvia has 52 cells, which get thinner closer to the wing tip. The slim elliptical form of the canopy has an aspect ratio of 5.26. Diagonal V-tapes and a system of load-bearing lines give the canopy stability and influence easy behaviour during extreme manoeuvres. The Velvia is equipped with light Dynema risers. New-The Dynema tapes are now protected by a sheath. The lines are connected to the risers by loops to save weight. Just one small circular maillon is used on the “C” riser and Brummel-hooks on the accelerator system. The Velvia has very easy ground handling. Everything feels very predictable in all launch conditions. The canopy is very resistant to collapse. It features excellent stability throughout the full weight and speed range. In an induced collapse the glider does not rotate quickly and will usually reopen within 50 degrees. The opening is smooth and predictable. Easy launch and landing characteristics are a must for a mountain glider and the Velvia has these in abundance. Despite high performance potential and agile handling the Velvia has good dampening in all axes. 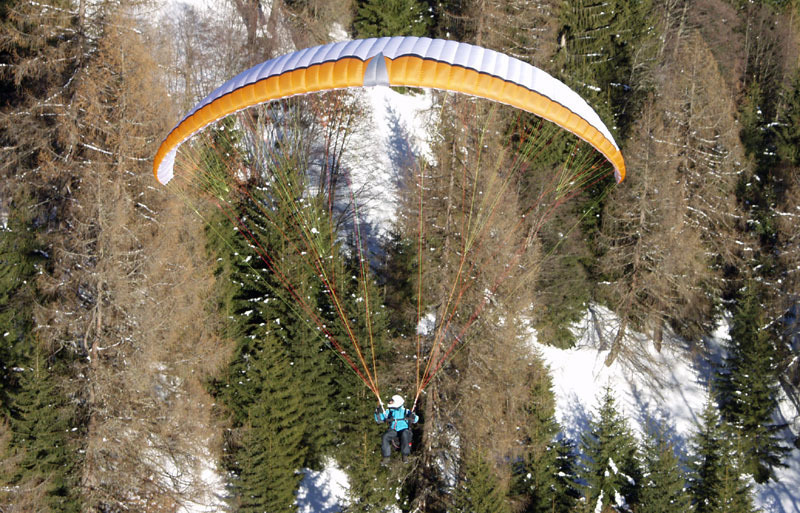 The canopy does not over shoot and does not hang back when flying in or out of thermals. The light brake pressure allows pleasant turns during long thermal flights, but increases progressively toward the end of its travel to offer safety reserves. 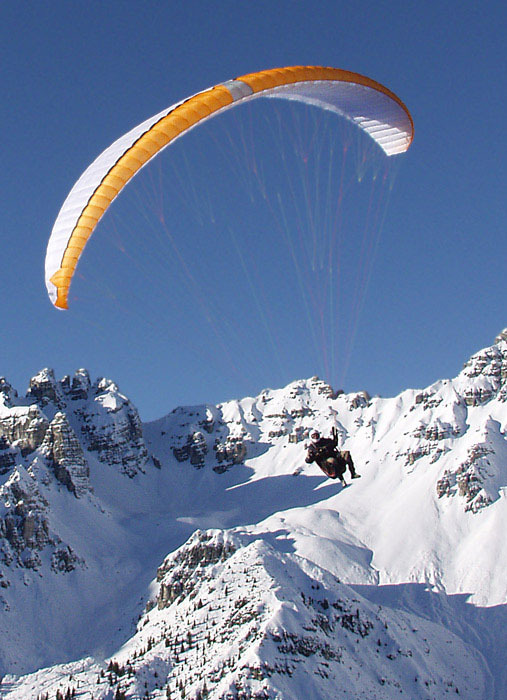 The Velvia is manufactured using the paragliding industries well established lightweight materials with excellent durability and low weight Skytex 40 and Skytex 36, from Porcher Sport (NCV). Because for any glider, the part that always wears out first is the leading edge, we use Skytex 40 with double water repellent coating E77A for this. For the less stressed areas of the sail we use calender Skytex 36 with E68A coating for top sail and Skytex 9052 for bottom sail. For the supporting and diagonal ribs we use Skytex 40 with “hard finish” coating E29A. This gives the advantage of a sail that is both lightweight and very durable.